The Internal Transport minister has released a statement that In line with the government’s programme of providing relief to the public, three-wheeler fares and school van fees will be reduced by 10 percent and five percent from today (1st February 2015). He stated that ministry has negotiated with the All Island Three Wheeler Drivers and Owners Association and the Sri Lanka and AD Ceylon School Van Drivers’ Association to bring down school van fees and three wheeler fares. Measures will be taken to sort problems in the three wheeler and school van transportation as requested by their owners and operators. Measures will be taken to regulate the two transport modes by introducing rules and regulations. He stated action will also be taken to reduce bus fares of both SLTB and private super luxury buses plying on expressways. Vehicle Importers Association Chairman Mahinda Sarathchandra stated to media that prices of vehicles below 1000 cc would come down only by Rs. 25, 000 in the wake of the 15% tax reduction announced in Thursday’s mini budget while all hybrid cars would go up by as much as Rupees one million. The custom duty for less than 1000cc vehicle is 172.5% which had been imposed on cars below 1000 CC was reduced to 155.25% which would result in a decrease of Rs. 25, 000 for cars below 1000 cc. And he stated that however prices of hybrid Electric cars would go up by a huge amount due to the new tax system. he said the price of a Prius hybrid car would go up by Rs. 975, 000, Axio hybrid car by Rs. 725, 000 and Honda Fit hybrid car by Rs. 700, 000 because of the new taxation. He said the tax revisal would have an impact on vehicle importers. When outward remittances are made by commercial banks or authorized dealers, they are expected to ensure that the remittances are made in compliance with the tax laws. therefore, you are kindly requested to obtain a Tax Clearance Certificate with regard to remittances mentioned in Part B and forward the same to the respective Bank or Authorized Dealer in order to remit your money. A clearance certificate is not required in relation to following remittances. Remittance of sale proceeds of quoted shares owned by non-residents in companies resident in Sri Lanka. Remittance of dividend paid to non-resident shareholders by resident companies. Foreign investments by residents of Sri Lanka. Transportation expenses in relation to freight forwarding, courier services and airline services involving the carriage of passengers and goods. Payments to expatriate employees which include wages, salaries and other benefits which has been subjected to tax under the PAYF, scheme. Remittances by export companies in respect of services in relation to advertising and marketing performed outside Sri Lanka. 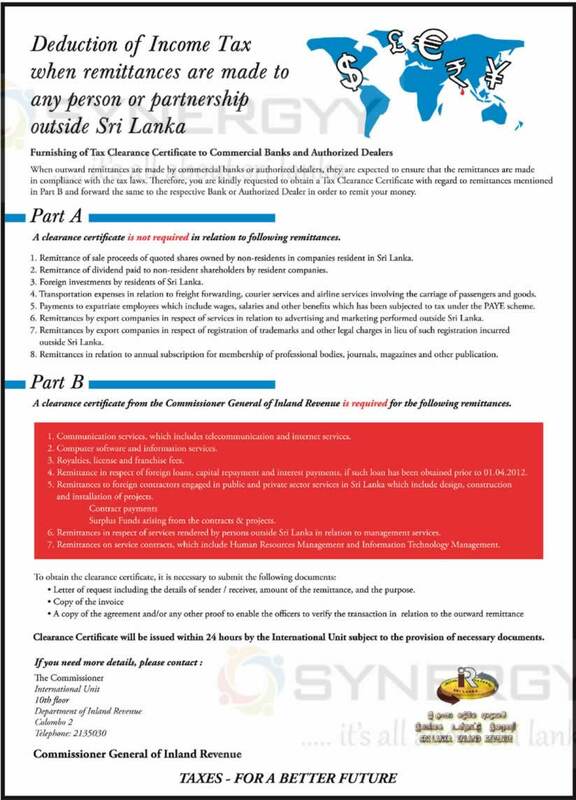 Remittances by export companies in respect of registration ol trademarks and other legal charges in lieu of such registration incurred outside Sri Lanka. Remittances in relation to annual subscription for membership of professional bodies, journals, magazines and other publication. A clearance certificate from the Commissioner General of Inland Revenue is required for the following remittances. Remittance in respect of foreign loans, capital repayment and interest payments, if such loan has been obtained prior to 01.04.2012. Remittances to foreign contractors engaged in public and private sector services in Sri Lanka which include design, construction and installation of projects. Surplus Funds arising from the contracts & projects. Clearance Certificate will be issued within 24 hours by the International Unit subject to the provision of necessary documents. Mr. R.N. Raj Kumar offering a Jenny Cab services in Jaffna town with 4 numbers of TATA Nano Cars, the services are offered at special rates at affordable as Rs.100.00 for the first Km and Rs. 50.00 from additional every Km. The Budget taxi services are available from 6.00 Am to 10.00 Pm in front of Jaffna Hospital. 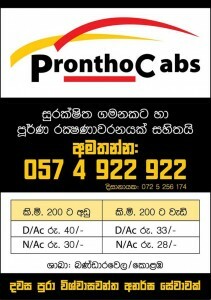 Its convenient taxi service as offered in Colombo by Three wheel lanka. 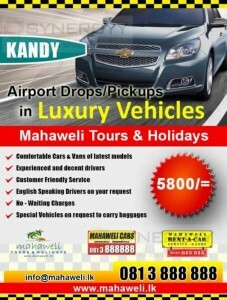 Mahaweli Tours & Holidays provides comfortable taxi services in Kandy regional areas along with Airport Dorps and Pickups. And Mahawwli Taxi Services are offers daily Taxi Hiring services to side seen Kandy within a day at an affordable price of Rs. 5,500.00 (Approximately USD 45.00) for whole day. This is a very much comfortable and customer friendly services in Kandy. 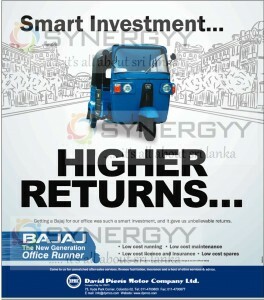 Bajaj Three Wheeler is an Investment for the Official and Private purposes, many of Sri Lankan are enjoying such a smart investment, and it gets unbelievable returns. For more information see below image or contact to David Pieris Motors Company Ltd at No75, Hyde Park Comer, Colombo 02. Budget Taxi a Srilanka premier Taxi service provider has made an agreement with AMW Srilanka to purchases 500 Maruti Suzuki Alto cars for their taxi services. The Budget Taxi services are currently confined to Colombo City and it is expected to expand its services in Kandy and Galle too. The Budget Taxi Managing Director Mr. Kelum Jayasumana said the Maruti Alto is bestselling car in Srilanka due to special features of good fuel efficiency, fair price, after sales services and readily available spare parts. 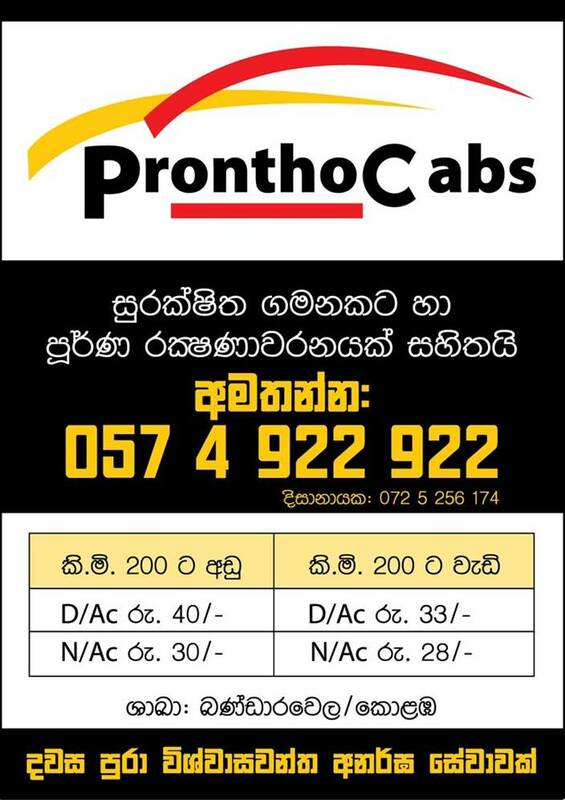 Here is a Budget taxi’s in Bandarawela and Colombo, enjoy a dynamic and comfortable taxi services with Prontho cabs in Colombo and Bandarawela.